At the easternmost edge of the Harbourfront stands this rather striking monument to the local sailors who gave their lives in two world wars. Below it lie two eight-inch guns, both trained on the base of the Jacques Cartier Bridge. Apparently, at certain times of the year – my guess business hours during the summer, you can climb to the lookout up top. Never met anyone who’s ever been inside though. Named after the Swedish humanitarian who saved thousands of Hungarian Jews from the terror of the Holocaust, the small square behind Christ Church Cathedral features a bust of Raoul Wallenberg in a cage wrapped in barbed wire, an emblematic image of the concentration camps. Wallenberg was likely killed by the NKVD on suspicion of being an American spy sometime in 1945 or 1947 – his feats of heroism and bravery during the war earned him a spot as a honourary citizen of Canada and as one of the ‘Righteous among the nations’, an honorific bestowed by the state of Israel. 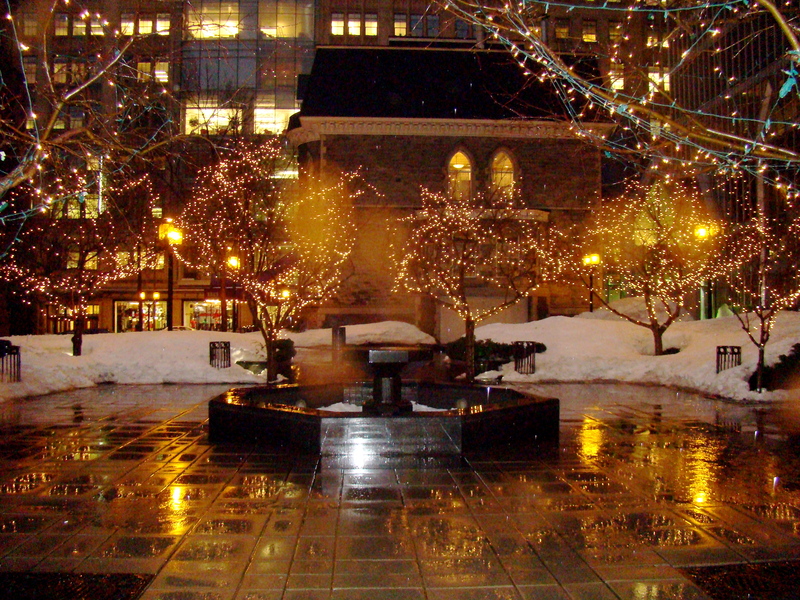 The Square is composed of three principle buildings; aside from the cathedral, there’s the former presbytery, now a French restaurant and the Tour KPMG. Along the union side, there’s an arcade-wall with plaques demonstrating what stars and constellations can be seen from the square at certain times of the year. It’s an extremely pleasant little spot, particularly enjoyable in the summertime when the city’s birds make excellent use of the fountain. Moreover, the trees along the edge of the ‘courtyard’ portion, pictured here, have been pruned to make each bench feel like a private alcove. Enchanting really; a must-see. 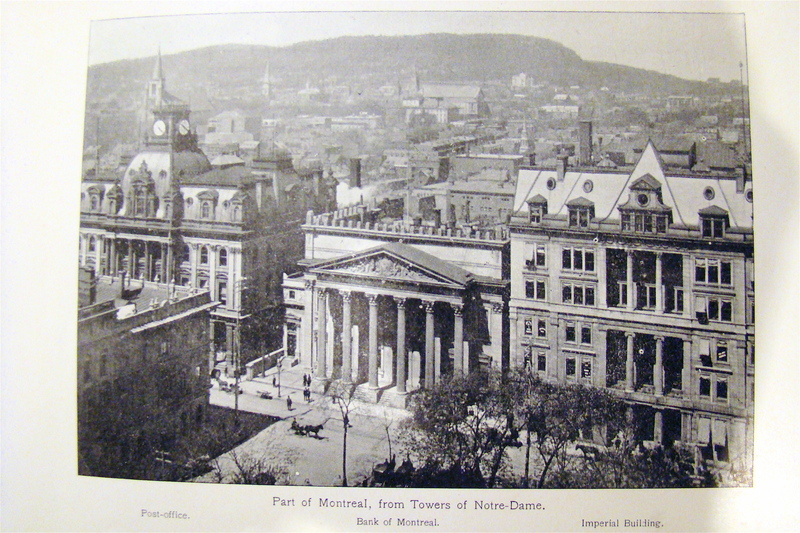 Here’s the financial centre of Montréal, circa 1900. The New York Life Insurance Building, to the left, was the first skyscraper in Canada. Built between 1887 and 1889, it would house the premier legal library in Canada on the 9th and 10th floors, just below the clock. 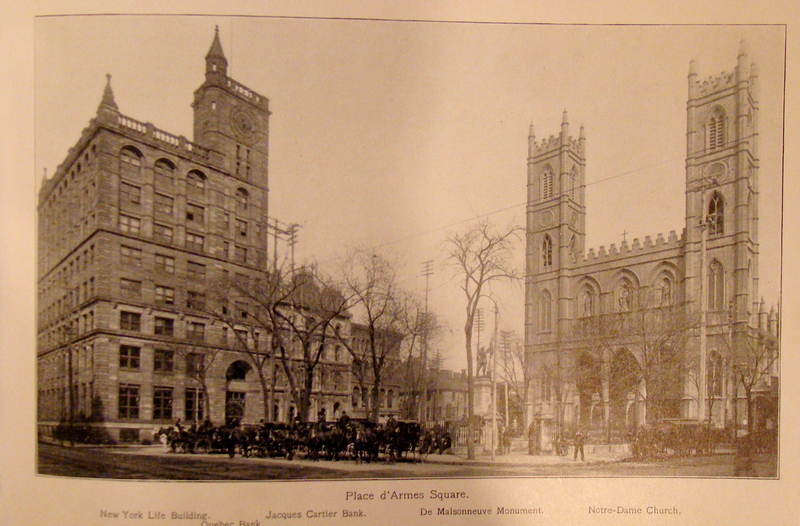 Also found on this square back in 1900, the Bank of Montréal’s head-office, the Post Office, numerous smaller banks and insurance companies, let alone the still-dominating twin spires of Notre-Dame Cathedral. Even though it clearly states ‘looking West’, I can imagine it would’ve looked about the same facing East. Can’t figure the cross-street though. 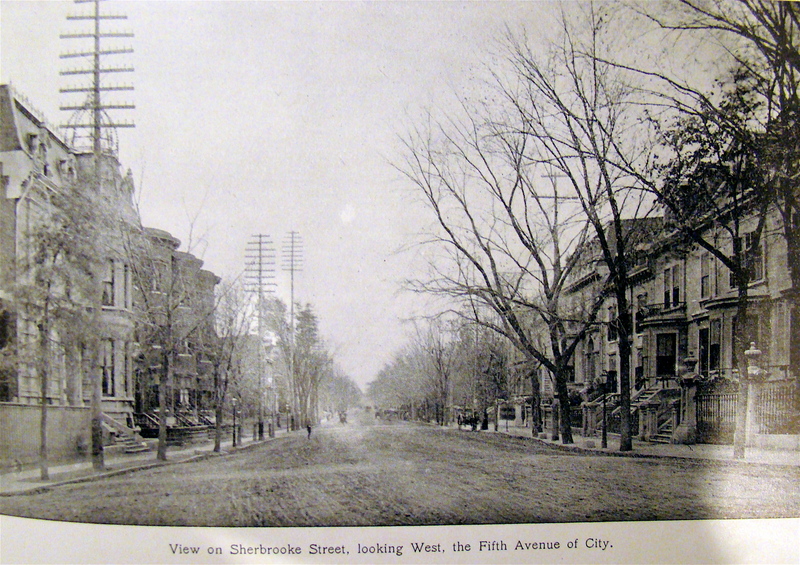 Love the residential character of Sherbrooke Street back then. I wonder if downtown public schools will ever make a come-back. It feels odd living in a city where the only downtown schools are generally private, or FACE. 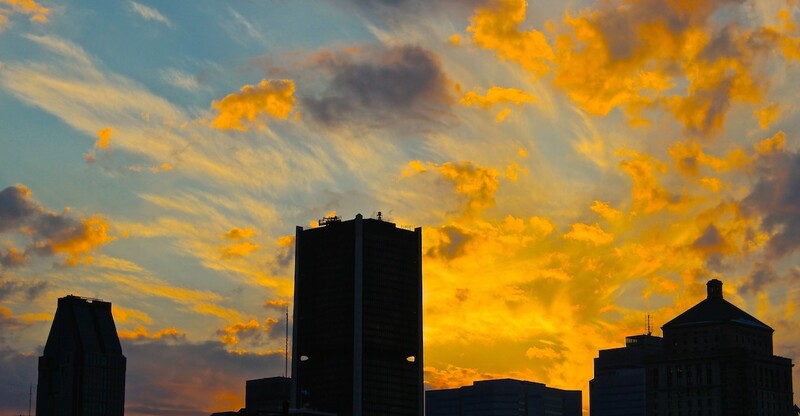 May become a necessity if the city is successful in encouraging more people to emigrate back into the city. This picture looks as though it should be in the dictionary next to the expression ‘hustle & bustle’. Again, notice the residential feel to some of our busiest, highest capacity urban streets. Seems quaint by comparison. Dominion Square, way back in the day. The square looks almost brand new in this picture. 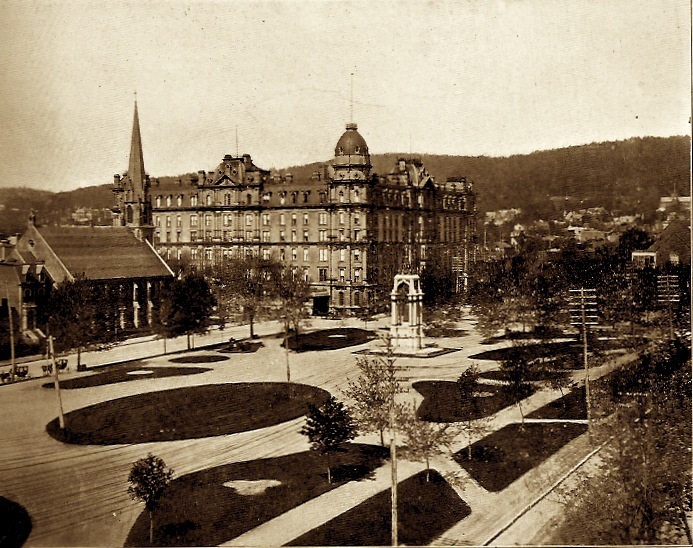 Consider this, when this photograph was taken the Windsor Hotel would have been the undisputed highest-class hotel in the entire city. The view from the hotel would have been striking, as the newly renovated Dominion Square opened up the new uptown and framed the many churches built around, none more impressive than Mary, Queen of the World Cathedral. 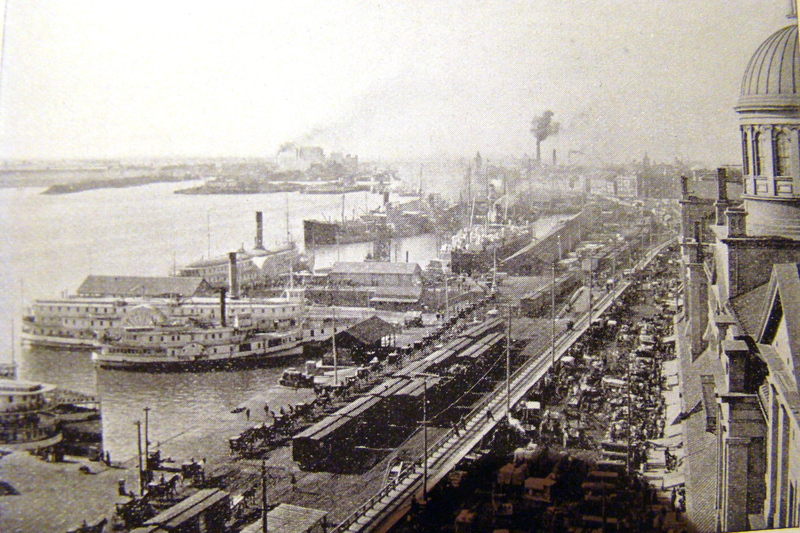 Back in 1900, the entire city was about 400,000 people – a significant but by no means large North American city. Anyone who was anyone, including Oscar Wilde and Mark Twain, stayed here and would have seen this each morning. 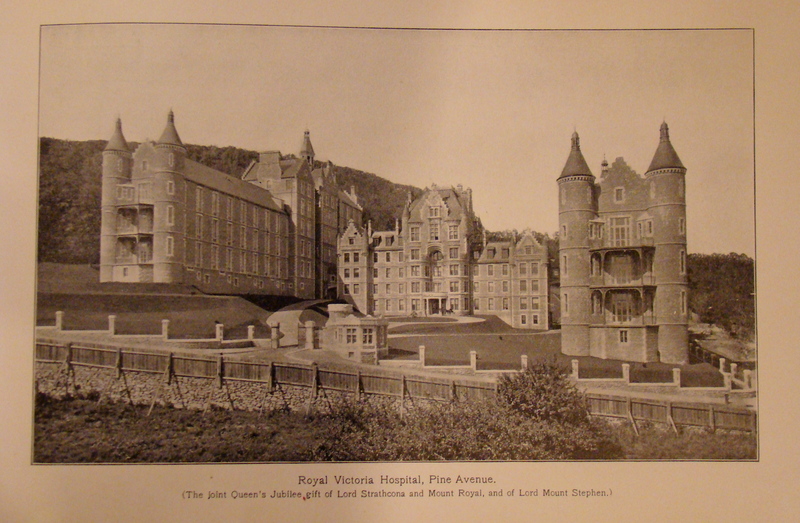 Moreover, back then, this would have been a residential square, with beautiful Golden Square Mile homes running the length from behind the hotel straight to the Mountain. Children probably played here. Odd to think of that now eh? 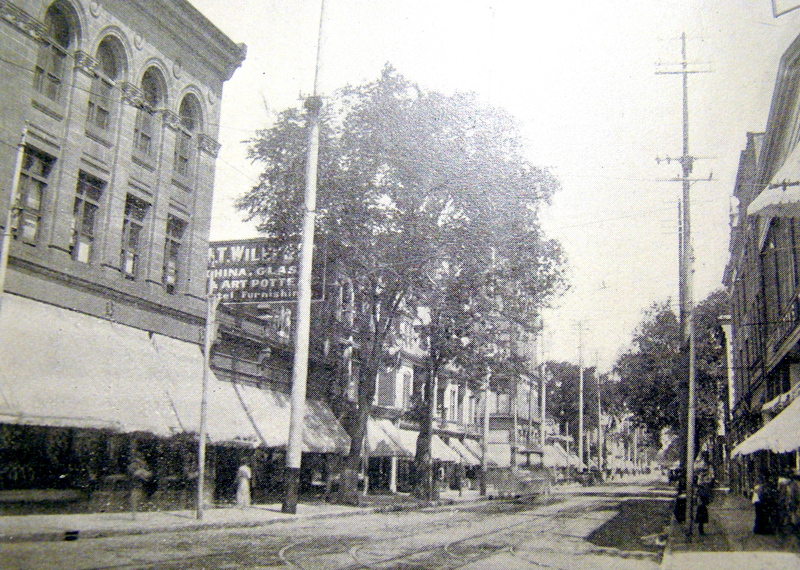 This is the view south along McGill Street from Rue Le Moyne in the Old Quarter. I love the scale of the buildings in this area, and the liberal use of sandstone and similarly coloured brick on these late-Victorian era office buildings gives this particular street a vibrancy unique among the commercial streets in our city. Would make an excellent promenade, though in order to get cars out of the Old Port, access to the Métro would be ideal – consider that Rue de la Commune is about a twenty minute walk from the Orange line, and the distance between the Orange and Green lines can be as little as five. Part of what makes the Old Port so magical is the fact that there’s so much architectural and design variety over a relatively large area, it practically begs your attention. It would be great to free up some streets to allow many more people the chance to experience the streetscape in its totality. Moreover, of all the sectors of the city ideal to commence a ‘pedestrianification’ of the street system, the Old Port’s 19th and 18th century road planning was designed with people, not cars, in mind. May as well start here.